I can’t believe it took me so long to find out about the Simon Says Stamp and Show Challenge blog now called the Monday Challenge Blog. With my love of all things shabby and vintage, it’s right up my alley. 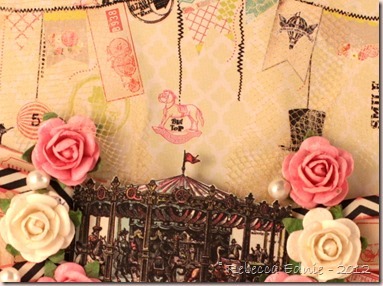 This week’s challenge of Carnivals wasn’t super interesting to me until I looked at this month’s SSS card kit! The papers in it were perfect! I’m going to keep it short and sweet today as I have 10 other projects to post! Yep, I participated in PTI’s Stamp-a-Faire so I have to blog all of those too. One thing that is hard to see both in the photo but also IRL is the gold tulle. If you look at the top hat above the top right rose you can see it. I sprayed it with gold mist so its uneven and very vintage looking. LOVE it! IRL it adds an ethereal quality and you don’t notice it at first but you can see it. I absolutely LOVE this project! Yep: LOVE deserves to be in capital letters on this one! I was just really impressed with the concept and the unique way you put all the elements together. I've never seen anything quite like it and I'm so grateful for the inspiration! 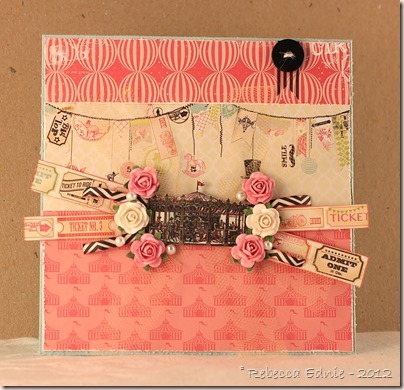 Thank you for sharing your skills with us here at the Simon Says Stamp Monday Challenge blog!